Yod - a Hand; or rather the pointed index finger on the hand, with all the other fingers closed. It, too, is a phallic symbol, representing the spermatozoon or the unconscious will-essence (libido) and, in the various legends, the youth setting forth upon his adventures after receiving the Wand - or attaining puberty. The magical weapons are the Wand, in which the Freudian significance is clearly perceptible, the Lamp, and the Eucharistic Host. The significance of the Hand of God or the Dhyan-Chohanic consciousness, setting the world-forces in motion, may also be read into this letter Yod. 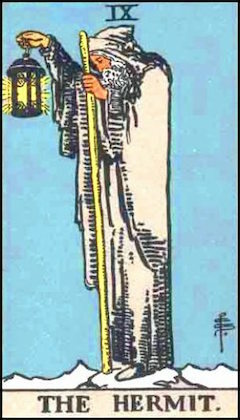 The Tarot card, IX -The Hermit, gives the conception of an aged Adept, cowled and robed in black, holding a lamp in his right hand, bearing a wand or staff in his left. The conception of this Path as a whole is that of virginity, its astrological sign being Virgo. We attribute to it the unmarried Isis and Nephthys, both Virgins. .The Hindu equivalent is that of the Gopi cow-girls, or the shepherdesses of Brindaban, who became enamoured with love of Shri Krishna. Narcissus, the beautiful youth inaccessible to the emotion of love; and Adonis, who was the youthful beloved of Aphrodite, are other correspondences. Balder, as the beautiful virgin God residing in the heavenly mansion called Breidablik into which naught unclean could enter, is undoubtedly the Norse attribution. Its jewel is the Peridot; its flowers the Snowdrop and Narcissus, both implying purity and innocence; and Its colour Grey.